When Ronald Reagan invoked "a shining city on a hill" or George H. W. Bush "a thousand points of light," their words were engraved on the public's consciousness as signatures to their personal beliefs and a catalysts for political action. Such iconic phrases in presidential speeches are often the creation of presidential speechwriters, who are entrusted with framing a message consistent with each administration's broad goals and reflecting each president's personality and rhetorical skills. This book takes a closer look at presidential speeches over the course of six administrations. Editors Michael Nelson and Russell Riley have brought together an outstanding team of academics and professional writers-including nine former speechwriters who worked for every president from Nixon to Clinton-to examine how the politics and crafting of presidential rhetoric serve the various roles of the presidency. They consider four types of speeches: convention acceptance speeches, inaugural addresses, state of the union addresses, and crisis and other landmark speeches that often rise out of unpredictable circumstances. Together, these scholars and writers enable readers to sort out the idiosyncratic from the institutional while gaining insider perspectives on the operating style and rhetorical manner of each of the six presidents. The book is rich in character sketches-such as Jimmy Carter's attempt to tie his understanding of original sin to the practice of American politics—and brimming with insights into the internal dynamics of the White House, including tales of internecine bloodletting under Ronald Reagan. 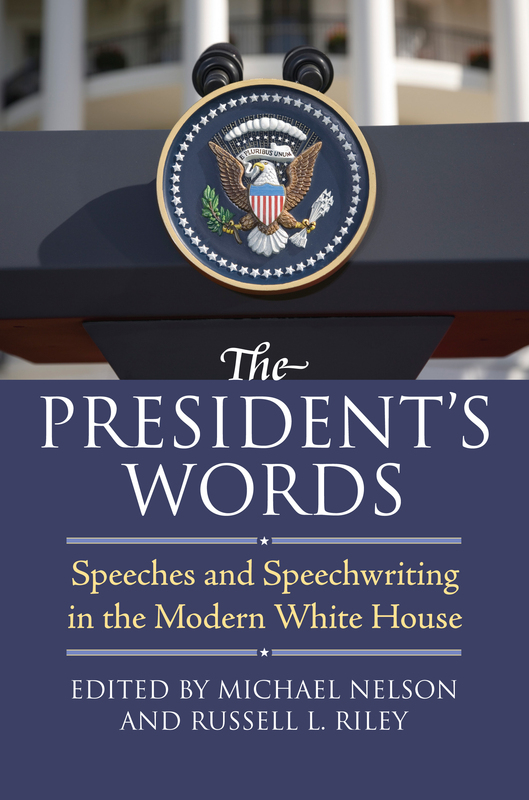 Most significant, these discussions help us better understand the contemporary presidency by revealing the enduring and evolving features of the institution, underscoring how the operating style and rhetorical manner of each president shapes the speechwriting process in the service of his broader policymaking goals. These essays show not only how speechmaking has become a major presidential activity but also how speechwriters have become important political actors in their own right. They offer students and observers of the political scene a rare opportunity to consider the crafting of those utterances before weighing their effects. Michael Nelson is the Fulmer Professor of Political Science at Rhodes College and author of Presidents, Politics, and Policy and The American Presidency: Origins and Development, 1776-2007, among other books. Russell L. Riley chairs the Presidential Oral History Program at the University of Virginia's Miller Center of Public Affairs and is the author of The Presidency and the Politics of Racial Inequality: Nation Keeping from 1831 to 1965.